WITH Obama giving a stump speech in Berlin (Ich bin ein Illinoisan) and McCain visiting a German restaurant in the Midwest, I can say without reservation the silly season is upon us. Well, not quite. The only thing missing are those robocalls in which the candidate — or some worthy surrogate — (Madonna? Susan Sarandon? Phil Gramm?) give a recorded spiel on how we should vote in November. It’s July, so people may have forgotten receiving a deluge of annoying, intrusive automated calls from candidates during the presidential primary in February, usually at dinner time or when your favorite show is on TV. Shaun Dakin, a marketer who founded the Web site StopPoliticalCalls.org, hasn’t forgotten. He’s collected 50,000 names from people who want to block these political robocalls. While the federal Do Not Call Registry has about 160 million phone numbers on it, most of these Americans don’t realize that charities, market research and political calls are exempt. “You can’t get too angry at charities. But nobody likes politicians. No one is very happy with political robocalls,” Dakin told me Friday morning. Dakin is joined by California Sen. Dianne Feinstein, who co-authored legislation this year that would ban robocalls between 9 p.m. and 8 a.m. and restrict political calls to no more than twice a day per telephone number. Feinstein was awakened to the issue in February when she taped a political message for another candidate. Thousands of California voters heard: “Hi. I’m Dianne Feinstein …” when they picked up their telephones and were outraged. “They sent out the calls at 3 o’clock in the morning,” Dakin said. Talk about the phone call at 3 a.m.
After getting a flood of calls from very real and very angry constituents at her senate office, Feinstein said “she learned her lesson” and would not make another robocall ever again. And, she set out to regulate the practice. Feinstein and other legal experts believe that it is a violation of free speech to outlaw political calls. So, she’s chosen to regulate the worst practices. Others wonder how effective these calls really are. In fact, some political strategists say they turn voters off. But the issue gets down to money. Dakin said it once cost about 25 cents per call. Now, vendors have lowered that to 2 cents or less per call, making robocalls the cheapest form of political messaging. A Pew Internet & American Life Project study found it is the No. 1 form of congressional communication. The study found that 81 percent of Iowa voters received robocalls during the caucuses. Companies doing these calls would lose big bucks if the practice was stopped or curtailed. There’s also a matter of the law. The calls are illegal according to California Public Utilities Commission’s own rules. Yet, the CPUC has not picked up a phone to call off these robotic nuisances. According to CPUC Code Sections 2871-2876 (http://law.justia.com/california/codes/puc/2871-2876.html), the call must begin with a “live” caller and he must ask permission of the person being called before hitting the play button. The “live” person must also identify the organization making the call. As Dakin said, using live people would defeat the purpose. Dakin said he’s received thousands of e-mails from people who are fed up with robocalls from political candidates. Many are people who work at night and have had their sleep interrupted. Others are stay-at-home mothers whose infants are awakened from naps. Senior citizens — a high propensity voting bloc — report getting 15 or more calls a day. If the state were to abide by the law, the caller would have to be live. At least the person answering the phone could have the satisfaction of venting to a live human being. 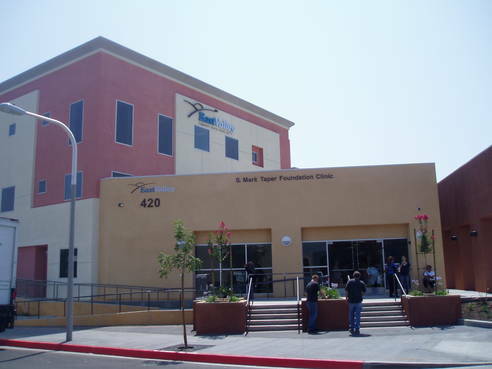 The new East Valley Community Health Center at 420 S. Glendora Ave. in West Covina opened its new facility last week. Alicia Mardini, chief executive officer, stands in front of waiting room. The day the clinic opened the new building was filled to capacity. WEST COVINA — There are those who talk about healthcare and those who do something about it. In the doer category are Alicia Mardini and the folks at the East Valley Community Health Center. This place opened its new, 25,000-square-foot building about a week ago here. It is three times the size of its old building. One the day it opened, the patients waited outside the building. The clinic reached capacity that same day. 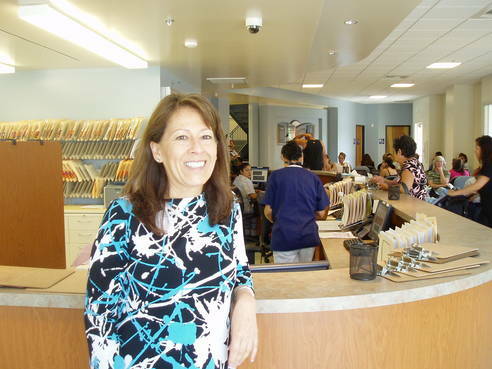 Filling a need — helping the poor and the uninsured get basic healthcare — is what Mardini and East Valley Community Health Center do. They see 120 patients a day (and that doesn’t count those here for blood work or lab visits). It adds up to 45,000-50,000 patient visits a year. The bulk of those patients are in their 40s and 50s. They work at blue collar jobs for employers who do not offer healthcare insurance. These are the working poor. They do not qualify for Medi-Cal because they work! Mardini said it is crucial for the clinic to see Medi-Cal patients as well because the state reimburses for those. However, looming state cutbacks has put that revenue supply in jeopardy. Also, with the state cutting back on the payments for doctors, fewer and fewer specialists are taking Medi-Cal patients. It’s incredible that in our country, right here in West Covina, people can’t get to see a doctor. In Los Angeles County, all the public-private clinics and county clinics running at full capacity can take about 1 million people, leaving almost 2 million uninsured residents without access to healthcare. That’s just in the county. “These are the people that if we don’t treat them, they end up in the emergency rooms,” Mardini said. The group took a big chance when it decided to build a new facility. It received $6 million from private donors, including the Ahmanson Foundation. But it still needed to take out a mortgage for the balance — about $4 million. That gives Mardini more wrinkles on her forehead. But the idea was to expand staff and see 50 percent more patients within the next five years. Those expansion plans are on hold. In fact, that may not happen because it faces state budget cuts that may require the clinic borrow money to stay open in the second half of the fiscal year. Instead of hiring additional medical staff, it may have to use that money to paying off its loans. “We know we will make it. It is just very hard,” Mardini said. “I winced. I’m sure that’s what the New Yorker’s esteemed editor David Remnick expected me to do when I saw the Barack and Michelle Obama caricature cover that everybody’s talking about,” wrote Clarence Page in his latest column. A quick check at the Arcadia News Stand on Duarte Avenue found them totally sold out, according to a friend who is trying to get a hold of one.